At first sight, superheroes and economics seem to occupy completely different dimensions – but a clash of dimensions is a classic comic book storyline! 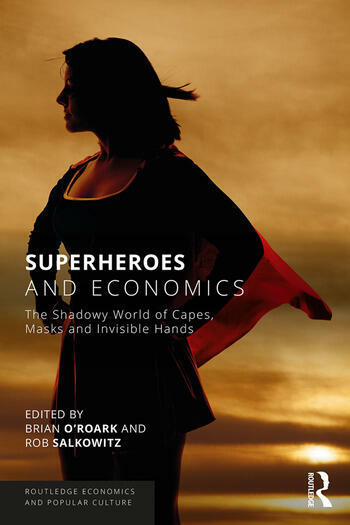 In this first-of-its kind book, an economist and a business writer assemble an A-team of academic talent to explore the intersection of superhero mythology and economic theory in ten accessible chapters. Superheroes and Economics uncovers basic economic truths that are integral to the comic stories from some of the genres most famous names. The authors of the chapters look at ways that economic principles can add authenticity to imagined universes, and how familiar superhero stories can demonstrate concepts used by economists to forecast the behavior of markets and individuals. If Spider-Man is so smart, why isn’t he rich? What are the economic implications of a tech entrepreneur like Tony Stark actually inventing Iron Man armor? What does the 80-year career of Wonder Woman tell us about the evolving role of women in the workplace? This unique book extends the scope of comics studies to encompass social sciences. It offers a great way to introduce both fans and students to topics like opportunity cost, growth, inflation, and cost benefit analysis, as well as more advanced concepts like moral hazard, utility functions and economic growth. This text can be used to supplement economics courses using colorful examples that any pop culture fan can relate to. Brian O’Roark is a University Professor of Economics at Robert Morris University in Pittsburgh, USA. He is on the board of directors for the Journal of Economics Teaching and serves in the role of associate editor. In 2014, Brian was given the Undergraduate Teaching Innovation Award by the Middle Atlantic Association of Colleges of Business Administration and in 2016 he received the President’s Award for Outstanding Teaching at RMU. Rob Salkowitz is an author, consultant and educator focused on the impact of new technology on work, business and popular culture. He is author of four books as well a contributor to FORBES and his work has appeared in Fast Company, Publishers Weekly, Entrepreneur, Bloomberg Business Week and ICv2, the trade publication of the comics and gaming industry. He teaches in the Communication Leadership Graduate Program at the University of Washington, USA and is founding partner in MediaPlant.